Welcome to the Coaching Blog! The Coaching Blog was launched during the 2018 Coaching Week (4th to 10th June) and gives some guidance on topics and tools that can support your development as a coach and provide a pathway to gain further knowledge from resources or courses online and in person. CIMSPA – Chartered Institute for the Management of Sport and Physical Activity is currently working hard to professionalise the coaching industry to have minimum standards for working in the sector and to have system in place to value coaches inline with the value they offer modern community in a current state of health crisis. In order for coaches to be a professional workforce it is important we learn and improve from delivery to managing coaches like a professional industry is expected. I’ve recently finished reading ‘Black Box Thinking’ by Matthew Syed, I would highly recommend to any coaches trying to better themselves and be more self-aware, but also it offers an important message that I only really connected with upon reflection and explaining why I was reading the book to friend. A chapter in the book is linked to Cognitive Dissonance, sounds confusing I know, its a term that describes the action of defending and strengthening your beliefs when being challenged with opposing views even if those views are well founded. The reason for me sharing this with you all is this is has a vital role in being a more diverse workforce and embrace the differences of others working in coaching. Attending coaching courses how often do you think ‘ I’m not sure I agree with that…’, whether it is from another coach or tutor, it is this thought that prevents us from developing are views and widening are ‘toolkit’ of coaching to be up-to-date. The other example is having someone who challenges you in your coaching, it is why many high performance coaches refer to mentors or have a partner who offers a different view. Gaining an extra perspective on matters in your work often makes it more inclusive and considers a wider audience’s views, in a coaching context Jurgen Klopp for most of his career has worked alongside good friend but thought challenger Zeljko Buvac. Their relationship is deep rooted and the idea of cognitive dissonance doesn’t exist between them, challenging each other in their thought is seen as support and help and not a personal attack, this is part of the reason for their success in breaking down Bayern Munich dominance and gaining the Liverpool job. Be critical: Knowledge and practice you have accepted and new knowledge you take in, understand why it works and be able to justify your decisions without having a confirmation-bias or self justification. Accepting errors and mistakes: If you can be more open about mistakes, then learning from them in a transparent manner will be less personal over time and offer better learning. Great example to set for younger people and players as well! Be varied: If you can work with different people in different settings you can have a wider range of knowledge base and be more confident in different settings whilst be challenged in your thinking and vice-versa. Remember to be critical though. Learn from other coaches on Connected Coaches, a free platform that shares fantastic resources and experiences of coaches and coach developers to support coaches across sports and ability levels. Starting in September 2018, we are planning to deliver monthly ‘Coaching Clinics’. These will be a combination of observation and discussion about what they have seen in the session delivered and sessions built around coaching the coaches in an area of their specialist expertise. We want to gather a pool of expertise to support Hertfordshire’s coaching workforce, beginners to experts across sports. These sessions will be taking place to give all coaches and coach developers the chance to engage in observing coaches and learning across the coaching spectrum (from young leader to performance coach). You’ll have the opportunity to either observe coach actions using reflective tools or learn about key areas supporting your coaching and think about how it will inform your coaching practice or approach to developing coaches. Chris Samways, Coaching Lead at Herts Sports Partnership, will be at the session to mediate discussion and support the delivery of the sessions where needed. I want to share a few moments from across the two days that I thought were really key for me to share on return to office to write this blog. The first learning is today’s blog. We want to develop coaches who are Confident, Independent & Reflective. If we can coach in this manner we can inspire a more active population and reap the benefits that come from being active. One of my favourite sessions was delivered by Richard Cheetham MBE, who focused on creative thinking within coaching and how you can engage a more creative style that encourages a participant to be active whilst pushing the their creativity to the max. He had a number of card games bought from charity shops that engage a creative element that can be embedded in to sport or physical activity session. Giving the participants the freedom of choice was a simple way to encourage thought and reasoning, selecting yoga poses from cards which included one in pairs. How can you engage your participants especially children to embrace creativity and problem solving skills that can support them in being more active, being better players and even reducing attainment gaps between high and low socio-economic groups. Can you tell an inspiring story that will engage your participants to embrace what you coach them? Why are you coaching your chosen topic? Be brave and try and incorporate creativity in your coaching. “Better people make better All Blacks” the mantra of the New Zealand’s dominant team under Graham Henry starting in 2004 that took them back to being the most successful sporting team in history with 86% win rate and World Cup victory. They key principle was developing the person as well as the player, a challenge for all coaches to take from this is you can make a difference to your players and participants and not only in a sporting context. Sport and physical activity can develop confidence, help encourage social skills, leadership and even assist with managing a good mental health and wellbeing. Can you strive to help your participants develop as person as well as a player. Learning can take many different forms and everyone will have a preferred style, understanding what that is and embracing that is key to developing your coaching. It is important to keep up-to-date with current practice in your coaching from Safeguarding and First Aid to Technical understanding and coaching styles. We can learn a lot from listening to our participants as well, they will offer a lot if you give them a chance. Having a continued focus on development and evaluation towards your coaching practice is important to enabling you to understand current best practice and continue to learn about how to coach better in formal and informal settings so you can provide better sessions for your participants. Various opportunities are available: workshops, NGB qualifications, online seminars/workshops. Masterclasses/Clinics, these will cover topics that are not sport specific but instead contain elements of wider skills in coaching such as: working with particular audiences, creating a positive environment, psychology and strength and conditioning. We want to share the knowledge of #GreatCoaching in Hertfordshire with you! Coaching Blog, these will provide short right ups of relevant topics to support your coaching that will link with courses coming or resources available to read further. We may have some interesting guest blogs as well. Safeguarding and Protecting Children & First Aid, we will continue to provide ongoing Safeguarding and First Aid courses, to make sure you are comfortable in your understanding. These are the essentials of coaching to ensure you are suitably aware of current protocols and best practice to ensure safety of your participants. Coach Education Week (CEW), our annual coach support programme that has trained over 8000 coaches since its inception providing courses, CPD and networking opportunities for coaches, teachers & leaders across Hertfordshire and beyond. Great coaches provide not only a positive attitude to their coaching but foster a positive environment between participants as well. Creating a constructive setting where views are welcome and encouragement from coach and participants is key to forming a healthy environment for enjoyment and development. A fantastic example of this is Moving Mums, a project that enables mums across Hertfordshire to be physically active starting at the school gates of primary, secondary schools and community groups. Organised by trained leaders from within the group and run for free and recognises the idea that anyone can be a coach and that the key attributes enabling a coach are those of positivity and motivation. With a little technical training as a run leader they can now engage their audience with the right messages and assist the aim of being more physical active whilst understanding the motivations of their audiences and being that “someone like me”. Balancing Success vs Challenge, this is key to building confidence but also enabling an environment where you can learn the most. Each group/individual will be different so try your best to keep adjusting that level till you get it just right. Praise Effort instead of Ability, being praised for effort is key to feeling valued, when you achieve you will relate it to the hard work you have put in rather than your natural ability. Ensure you are praising true effort and still appreciate ability/talent but with emphasis on effort. Safe Environment, taken for granted perhaps but this isn’t just about physical safety. Can you create an environment where we are all pulling in the same direction and all members support each other; can a participant try something new without being criticised? The importance of being organised in your coaching is fundamental in enabling great coaching, this can relate to planning, qualifications, continued professional development and meeting minimum standards of coaching. Having a plan of action for your session can be difficult especially as a volunteer coach who is giving up their own time already to coach and then asking you to then give up more time to plan can be unreasonable. Luckily there are more and more sessions that are shared openly on various coaching sites and social media pages that can assist you with having a plan in less time. The one note I’d add if you are to use these resources is make it yours by ensuring it relates to your participants and you don’t just copy the session. Remember Person-centred! UK Coaching also have a coaching forum called Connected Coaches which provides support for coaches across all variations of coaching. Groups on Connected Coaches include: New to Coaching, Coaching Youth (13-18yo. ), Coaching Children (5-12yo. ), Welcome and General, Inclusive Coaching, Embracing Technology and Coaching Adults. Building on from having a person-centred approach, you then need to consider using your understanding of your participants to build sessions over a longer term and not just as individual sessions. When you start to do this you will see development over time and recognise that the real outcomes of your sessions will start to come to fruition with a longer term approach with consistent messages. Start off with doing blocks of 4-6 sessions that can have individual focuses in each session but an overarching learning outcome across its entirety; this may be a topic such as in or out of possession in a sport such as football or in cricket you may having a focus on manipulating the field in batting where each session covering different shots. If you have any queries about any of these areas you may want to check out your National Governing Body site for your sport which should show opportunities to gain training through CPD, qualifications or online resources. Ensuring you make participants feel valued is key to developing them regardless of their ability. Whether your participants are trying to get active or they are elite performers, offering empowerment in some form is crucial to having their buy-in to what you are doing. The impact of empowering coaches is that it ensures sport and physical activity is more engaging, empowering and enjoyable. Ways in which you can include empowering in to your coaching are through giving choice and listening to feedback from participants, ensure you are make actions based on the feedback otherwise participants will feel disempowered instead. Can you let your participants make the rules for your game or perhaps allow them to decide how long their rest which can empower them to be more motivated and attentive during the time they are playing/training. Part of empowering is also related to ensuring the session is relevant to the expectations of the participants. This may be a challenge for some but as long as your participants feel supported they are more likely to be empowered and try new things where learning and development starts to take place. Hertfordshire’s Big Hit is a project encouraging young people to be involved in boxing sessions to engage them with something healthy and educational and to guide them away from potential bad choices in their local setting. Aiming to reduce incidents of anti-social behaviour and crime whilst improving the physical, mental health, self-confidence and self-esteem of the young people; the role of the instructors to empower them and motivate them to take on board the learning is an imperative skill in the project. Check out the video below talking to the one of the fantastic instructors who identifies the key areas around coaching boxing to young people. All of these elements relate to being able to make a session suitable for participants to attend but also enjoy. Creating a good environment to support individuals and the group is what person-centred is about and this will be different for everyone. If you can make your session relatable to an individual such as identifying their aims of attending a session, then you can ensure that a session is targeted around: social levels, coaching styles and correct level of ability. These benefits are important in maintaining physical activity and feeling valued in a group by focusing on knowing the player/participant before anything else. Allowing participants to give feedback to shape a session is a key element in being person-centred and also allows opportunity for you as a coach to expand your understanding and be more reflective without having to take away from practical coaching. 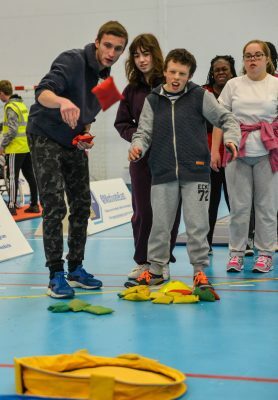 In Hertfordshire we have a fantastic partner who showcases person-centred coaching, working with people with varied disabilities, Herts Disability Sports Foundation (HDSF). Check out the videos below with Gobi and Michael who work with HDSF as they explain how their coaching relates to being person-centred and the activities they do to be inclusive at Greenhill Day Service, Hemel Hempstead.